Your cactus is a Cereus, but I'm not certain of the species. Kisal wrote: Welcome to the forum! It's nice to have you with us. At first I was mildly curious about the cactus but now it's starting to bug me. I'v had other people suggest cereus as well but I keep getting all sorts of different answers. You could use Google Images to look up all the different suggestions people have given you. You may be able to ID the cactus yourself that way. One of the problems with identifying cacti and succulents is that the taxonomy is changing, so the same cacti are often known by multiple names. Many are being moved from one family to another, from one genus to another, and even some of the species names are being changed. It's a slow process, and as it occurs, there can be some confusion. Cereus is a genus name for a certain group of cacti. There is wide variation in appearance among the various species included in the genus. 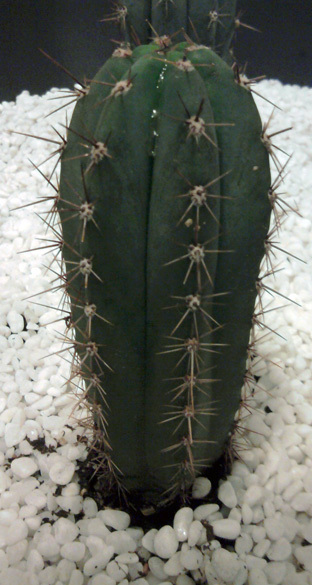 There is also the genus Trichocereus, now usually referred to as Echinopsis. I don't guarantee that my ID is necessarily, absolutely, undeniably correct; it's just the best I could do based on the picture provided. I even own cacti for which I don't know the specific IDs. Cereus or Armatocereus seem likely candidates. There are a lot of similar cactus species coming up from S. America these days and proper identification can be quite difficult. Most of these plants get quite large (8' - 30') and grow very quickly. Some tend to branch more than others, an important point since it's nice to know how much room to provide. They are all very easy to propagate via cuttings.